Seven teams that missed the Stanley Cup Playoffs in 2014 fought their way into them last season, the greatest turnover since 2005. Typically, an average of five teams work their way into the field of 16 that weren't there the year prior. In 2011, three teams went from out to in. So, which teams are most likely to get in this season after missing last season? The enhanced statistics on NHL.com can help provide an interesting perspective on questions like this. This space will be finding those answers throughout the season. In this example, consider the "Enhanced Stats & Making the Playoffs" chart below. It demonstrates a direct link between the Shot Attempts Close statistic and a team's chance of making the playoffs. Unless a team already scores well by this measure, like the Los Angeles Kings or Boston Bruins, reaching the playoffs will either require a dramatic improvement or a deliberate attempt to be one of the few exceptions that occur each season. 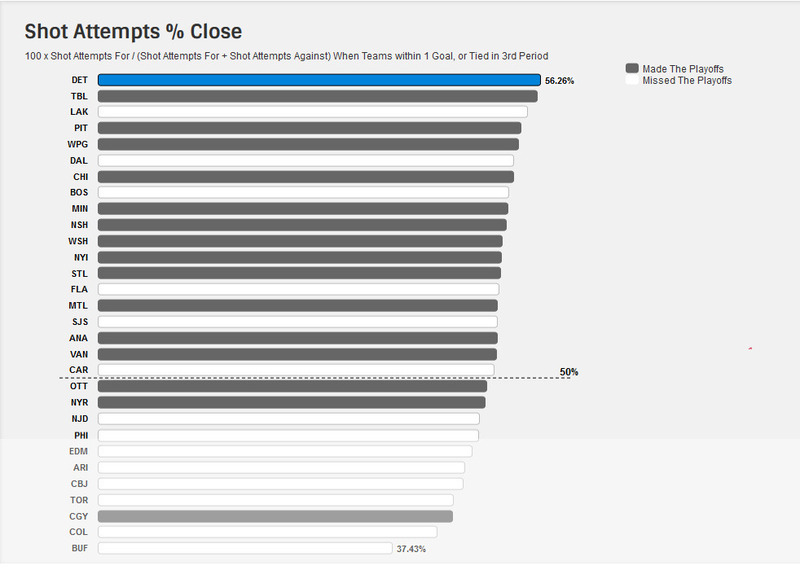 What is Shot Attempts % Close? This interesting stat is a team's share of on-ice shot attempts in close games. It includes all shot attempts: those that scored, were saved, hit the post, went wide, or were blocked. This particular variant counts only shot attempts when the game was close, in order to avoid the skewed numbers that sometimes occur when a team is sitting on or chasing a big lead. If you navigate to the Teams statistic section, select the Enhanced category, and the Team Percentages report. You'll notice there are 10 variations of this single statistic. Half of them involve all shot attempts (SAT); the other half involve only unblocked shot attempts (USAT). Those categories are further broken down into how each team does when they're ahead, behind or tied; when the score is close; and overall. In this case, we're dealing with SAT Close. Next, you'll notice there's a drop-down menu that goes back five seasons. That's perfect, because it provides the data necessary to figure out how likely it has been for a team to make the kind of dramatic improvement necessary to get into the playoffs. That information is in the following chart. 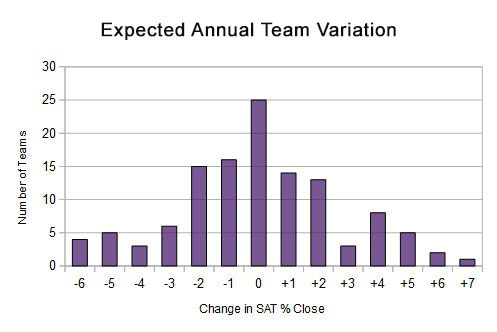 It illustrates that 70 percent of the time, a team stays within 2 percent of its SAT Close result from the previous season. So what does all of this mean for each team's odds of a playoff return? It's great news for Los Angeles, Boston and the Dallas Stars, because their SAT Close score is already in the playoff zone, even if it does drop by up to 2 percent this season. It's also great news that each of these teams has missed the playoffs for one season. As the following chart demonstrates, 20 of the 45 teams that successfully returned to the playoffs during the past nine years did so after a single-year absence. This trend could bode well for the Philadelphia Flyers and San Jose Sharks, who are within 2 percent of the playoff zone and have missed for one season. Teams at least 2 percent below the playoff zone in SAT Close -- Arizona Coyotes, Buffalo Sabres, Colorado Avalanche, Columbus Blue Jackets, Edmonton Oilers and Toronto Maple Leafs, will have to rely on either a dramatic improvement in their SAT Close or be one of the exceptions. 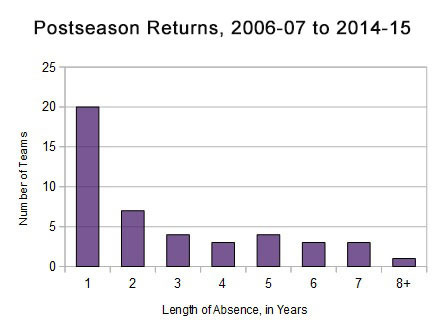 That is especially true for those who have a prolonged postseason absence. During the past four seasons, seven teams have made the playoffs despite falling at least 2 percent short of the playoff zone in SAT Close. How did they do it? By scoring on a (much) higher percentage of their attempted shots than their opponent. SPSv Percentage is another statistic that can be found on the same page; it is the sum of a team's shooting percentage (SH) and save percentage (SV). Most teams finish around 1000 in this category, but the seven teams above were safely higher, meaning they scored on a higher percentage of their shots than their opponent. In the age of the NHL salary cap, that's not a very easy or reliable way to make it into the playoffs, but it is possible. The other route involves being one of those few teams that makes dramatic roster improvements: trades, signing key free agents, continuing to develop younger players, grooming rookies, or replacing the coaching staff. Edmonton is a team that may fit that description. Based on this one perspective, Boston, Dallas and Los Angeles appear to have the greatest odds of returning to the playoffs. In contrast, Arizona, Buffalo, Colorado, Columbus, Edmonton and Toronto may have the steepest mountains to climb. Statistics are admittedly one particular way of looking at any question, and a single metric was used here, though one of the most reliable. This quick take obviously doesn't capture all of the complexity around each team's ambitions to make the playoffs, but it will be an interesting perspective to follow.